"RIP Seaside Heights," Nicole 'Snooki' Polizzi tweeted after Hurricane Sandy blew through the location of the Jersey Shore show, leaving what state Governor Chris Christie is calling "unprecedented" devastation. Shooting several seasons of the MTV show in the summer city, the cast spent a great deal of their time on the boardwalk and the Casino Pier rollercoaster, which is now under water. Snooki wasn't the only one to tweet about Seaside. Mike 'The Situation' Sorrentino wrote: "Seaside is going to get hit pretty bad... everyone please be safe! #staysafe." Jenni "JWoww" Farely tweeted a photo of hurricane damage, writing: "This is the street #JerseyShore @rivolis and @Sniptease is on. Now boats are on it." Meanwhile, Deena Cortese wrote: "Just lost power .. And it sounds like my roofs gonna Blow off..Won't be tweeting anymore have to save the battery on my phone !! 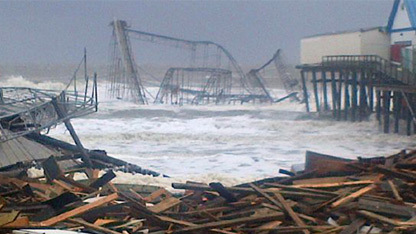 #staysafe"
DJ Pauly D tweeted: "Thinking of everyone on the east coast stay safe through this horrible time #hurricanesandy"
Vinny Guadagnino also wrote via Twitter: "#Sandy stop blowing the jersey shore you dirty b****." The final season of the Jersey Shore, set in Seaside Heights this summer, is currently airing on MTV.